Platinum Games; a company known worldwide for its prowess in action games, including the likes of the Bayonetta franchise. The Legend of Korra; a TV series in which a young girl controls (or bends) elements to defeat evil. It sounds like a match made in heaven then, another opportunity for Platinum to flex its muscles to a new audience. And I think the main problem is the audience that this title is pandering to. Platinum is known for making violent, action heavy videogames like; Vanquish, Bayonetta, Madworld and so on. The Legend of Korra is not what you’d call violent though. Sure, you beat up goons like the others, but there’s no blood, torture attacks or ripping people’s heads off. And that’s okay, because it wouldn’t make sense here at all. What the problem is, is that the whole game suffers as a result. It’s easy. Casual mode isn’t really worth talking about, in fact you can probably guess from the name who it’s aimed at. The normal mode really isn’t too much harder either though, a couple of difficulty spikes here and there, but really nothing to sweat over. In fact, the extreme mode isn’t exactly taxing either, but the game does start to shine in that mode. The issue with that though, is that you can’t play extreme mode straight out the box. You have to drag yourself through normal mode first. Difficulty is just one factor though, the core gameplay itself isn’t exactly a ball-breaking tasking. Combat is pretty standard stuff with square being a light attack and triangle being a heavy attack. There’s also dodging, blocking and shielding, as well as jumping. The combat is lacking and feels clunky, which caught me by surprise, seeing as this was made by the same geniuses behind Metal Gear Rising (and so on)… There’s a vague combat system, but it’s more akin to something you’d find in Dynasty Warriors than a Platinum game. You move from section to section fighting rather generic looking goons in a linear, uninspiring fashion. There’s hidden chests to sniff out, though hidden isn’t a word you shouldn’t be taking too literally, more like tucked away but hanging out slightly. The reward for discovering these chests is a vanity item, which gets added to a relatively small collection, and each item will give you a little bit of Spirit Energy, which acts as the game’s currency. There’s also platforming sections throughout most of the levels, but there’s nothing really all that challenging, even when enemies appear in awkward places. At the end of some of the levels, there’s a section where you ride on a beast called Naga. It’s a simple speed running section where have to avoid numerous obstacles as you get quicker and quicker. Like the rest of the game however, there’s no punishment for death, so making a mistake isn’t really a problem, especially with the frequent checkpoints scattered throughout the reasonably short sections. I’m not really sure what the game bases its scores on, but even if you take a hearty amount of damage, you can still get a platinum medal as long as you make use of both attacks and do it quickly. The game is reasonably short too, with it taking somewhere between 4 and 6 hours to complete the story and maybe 10 hours if you decide to do an extreme difficulty run through. If you want the platinum trophy, you’ll probably need 15 hours at most. Positives? Well the extreme difficulty is where the game’s combat makes the most sense. It flows a little better and the enemies are in a greater abundance, although not really that much harder. The final boss fight is pretty cool too and reeks heavily of Platinum’s style of over the top action. There’s also a pro-bending mini-game that’s pretty decent to play, though there’s more of luck element to it. In the combat itself, there’s switching between the elements you get to bend, and while it’s nothing new, it does add to the lacking combat system. 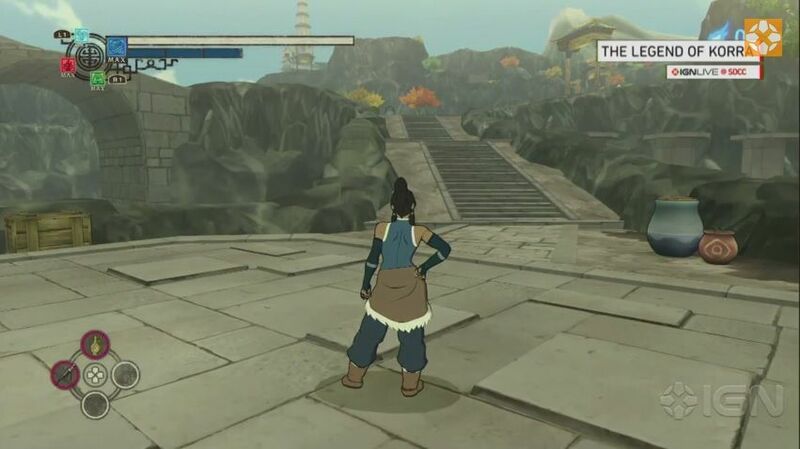 The Legend of Korra is a bit like a “my first action game”. It’s not very hard and it’s rough around the edges (dodgy camera angles are frequent). Ultimately the problem is that it tries to be accessible in its gameplay but falls short because its story and lore shuts those who haven’t seen the TV show. The Legend of Korra is also too short and lacks the replayability of other, better Platinum titles. A real mark against Platinum’s other near perfect plethora of amazing titles. Really disappointing.